Two Italian workmen arrive from Rome to do the electrics. A housekeeper from nowhere offers her services for free. A bishop insists that he evacuates his Church. All that before the public health inspector announces an infestation of ‘silent bees’. A hapless Father O’Flaherty is struggling to cope. Who wants him out of the way? What does it have to do with the hidden cache in the Holy Cavity? How does the legend of the Holy Key fit in? 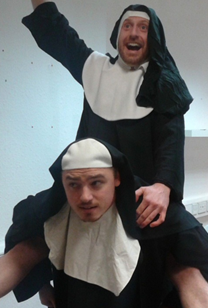 And why are the nuns and those Italian workmen never in the same room at the same time? Fiona Audley, Irish Post, March 15, 2014. This is a play full of cracking wit, brought to life by an experienced cast full of energy. The characterisation is finely tuned, and demonstrates great ensemble acting. The audience are taken through one unexpected turn after another plotwise, which is a delight and always engaging. I laughed out loud many times. This is one of those plays that charges your energy simply by watching it. Enjoyable, fast paced play with a Father Ted/panto feel to it. Very good timing for keeping in with the St Patrick’s day festivities too. Highly recommend if you want some Irish humour. An entertaining evening, good Father Ted style fun in this very pleasant newly created theatre in the old library building on Clapham North Side. A thoroughly enjoyable farce, from start to finish, crammed full to the brim with raucous laughter, spot on characterisations and lightning quick dialogue delivered pitch perfectly. The wisecraics (sorry!) come thick and fast in this very funny play full of local church characters and a hopeless criminal or two. Amidst the plots and subplots, the story whips along a pace and makes for a really fun evening. Lots of laughter and enough confusion to keep you guessing until the end but not enough to lose you. This was a funny and occasionally irreverent look at a descent into either madness or sanity. No-one was quite sure! A good performance from an ensemble cast and the first time I have ever had my toes mopped in the front row of a theatre! A funny play with strong actors and great comic timing, energetic and fast paced, would go and watch it again as I’m sure I’d see more detail in the madness on a second viewing. Great performance from Miss Malloy!